…the basics. traveling as a pescatarian in south america is a handicap at worst and the ultimate diet plan at best! i know from my previous foray this far south that i’m guaranteed a five pound weight drop which in the land of curves may not be that desirable. this is after all, the birth place of churrascaria and the definition of “steakhouse” is an understatement. on my last trip, i was forced into porcão as part of a team excursion and if i hadn’t been off meat before, this definitely would have done the trick. the aroma of roasted flesh overpowered even the vegetarian dishes and my appetite was gone the minute the skewers of meat appeared. the idea is to start of with the mundane chicken and carne cuts and move on to the more exotic fare of ostrich and crocodile. watching my coworkers take two bites and leave the rest personified ugly american, but i digress…. 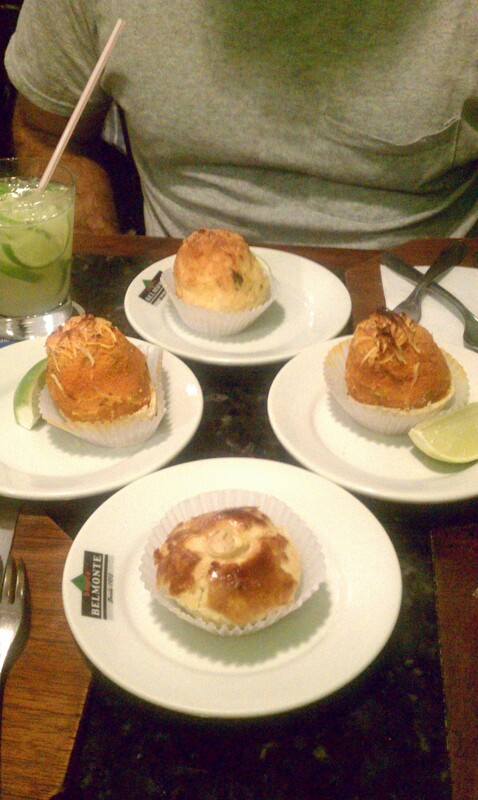 i want to talk about the basics of carioca fare and i’ll use my meal at the boteco belmonte to illustrate. first off, the pastel and empada. 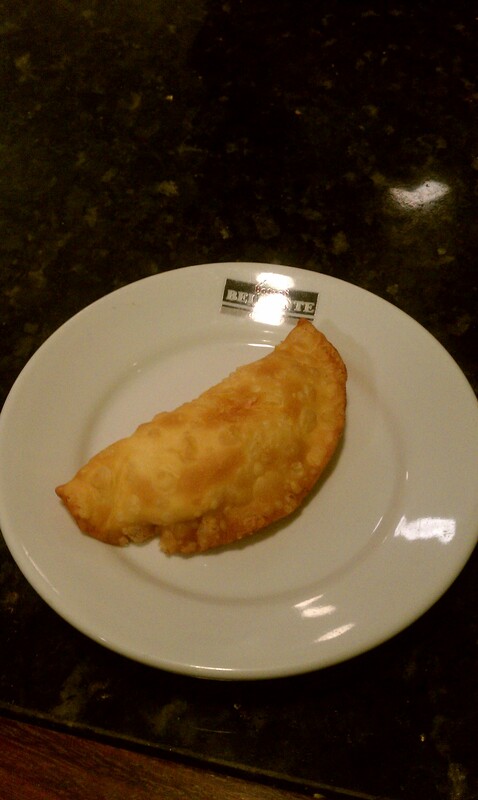 the empada, not to be confused with the empanada, are baked mounds of usually camarão (shrimp), frango (chicken) or carne in an incredibly flaky pastry cup in a round tin. below from top to bottom: row one, frango, row two, siri (crab) and the bottom is palmito or hearts of palm. the siri is especially delicious when you mash them open to add lime and chilies steeped in oil add zing to the meat or palm based empadas. 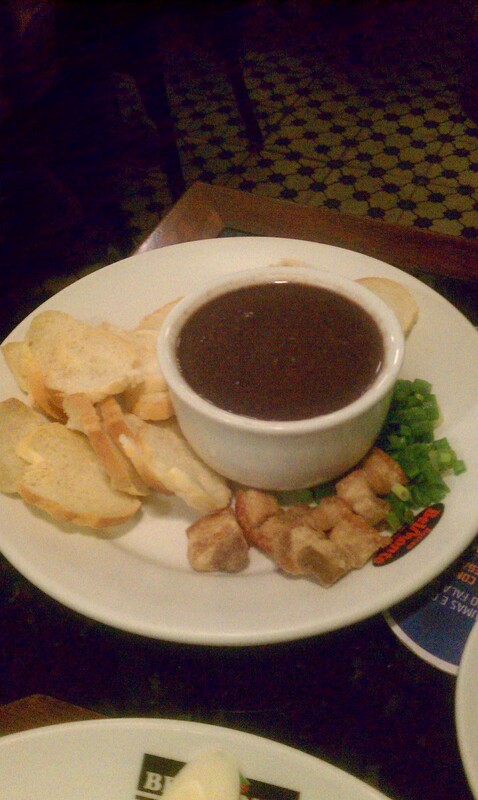 last but not at all least is the feijão the traditional black bean soup. not knowing what kind of soup base is used to flavor this dish, being that it’s south america, i can only assume it’s chicken or pork and pass. my partner had it at three different restaurants with academia da cachaça winning out overall. 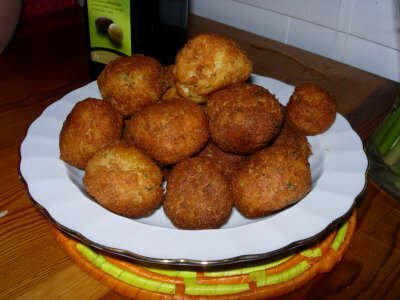 it’s usually served with bits of cooked salt pork, dried beef, onion, croutons, etc. to flavor by preference. all of these dishes are standard poor man’s fare that are staples in typical brazilian restaurants but the saving grace for this pescatarian are twofold, the bolhinos de bacalhau and the palmitos. the bolhinos are literally “portions” of salted cod which have been reconstituted and flaked into seasoned mashed potatoes. add eggs, onion, etc. and deep fry. as the brunt of protein in my diet, this, along with just about everything else we ate, was brown. trying to find greenery was like trying to win the super lotto and when i did find a salado misto, (yes!) it was usually iceberg. (no!) 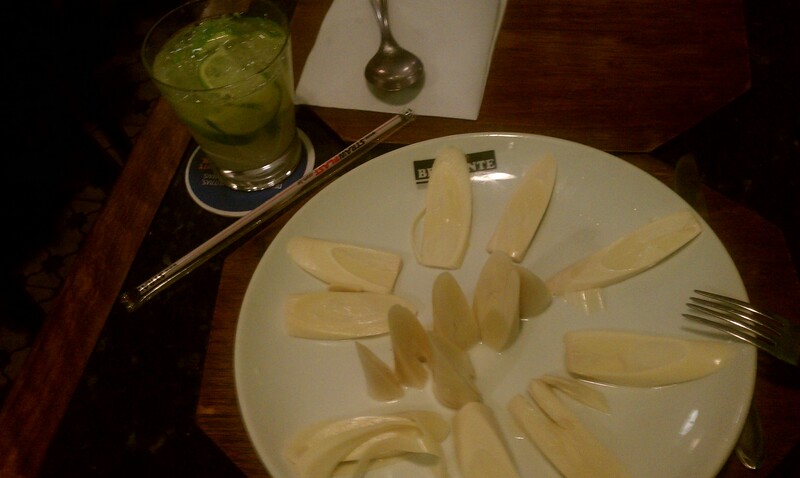 the salado palmitos, hearts of palm, is exactly that, no frills but delicious and highly addictive! for those who love antipasti, you’ll savor the mildly pickled flavor garnished with a touch of parsley and a light drizzle of olive oil. i loved rio but can only take it in small doses as fresh, cali cuisine full of fresh spring greens, veggies and unprocessed foods (read, not fried) are so close to my heart and the thing that make me feel my best. What’s your new gift on christ-mas day?